Knit these boot cuffs in record time. This is #1 in our Skill Builder's Series, and in this pattern, we concentrate on K2,P1 Ribbing, Crossing Cables and Moss Stitch. 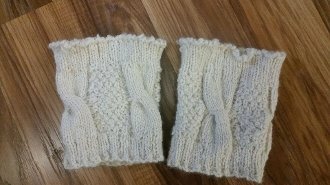 In the kit you'll get the pattern, Simple Cable Knit Boot Cuffs from Simply Notable and one skein of Cascade's Eco Cloud yarn. Chain plied, when knitted up, there's some heft to this fabric, it will stand up nicely.